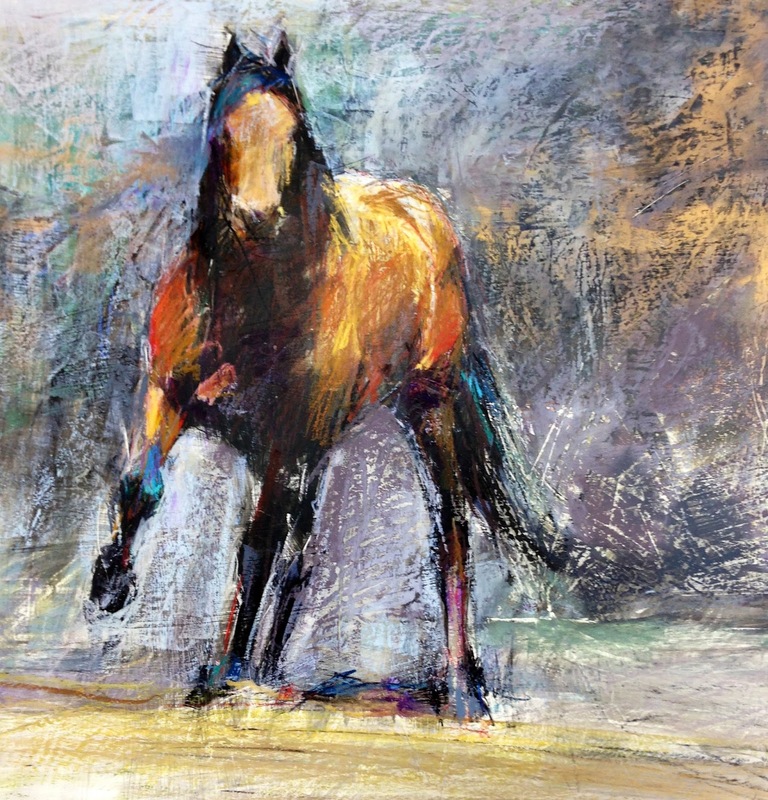 Oregon artist, Dawn Emerson has been working in soft pastel for over 20 years, perfecting her technique and showcasing the beauty of her environment while gaining international recognition as both artist and instructor. Below is her experience discovering Claybord. “In the printmaking studio I belong to in Bend, Oregon, a lot of people were raving about the amazing surface of Claybord™. As printmakers and painters, they were carving into the surface, using all kinds of media, and loving the fact that they could hang the cradled piece without a frame. Primarily a pastelist, I have been exploring mixed media, including monotypes, collography, and engraving for the past 8 years. 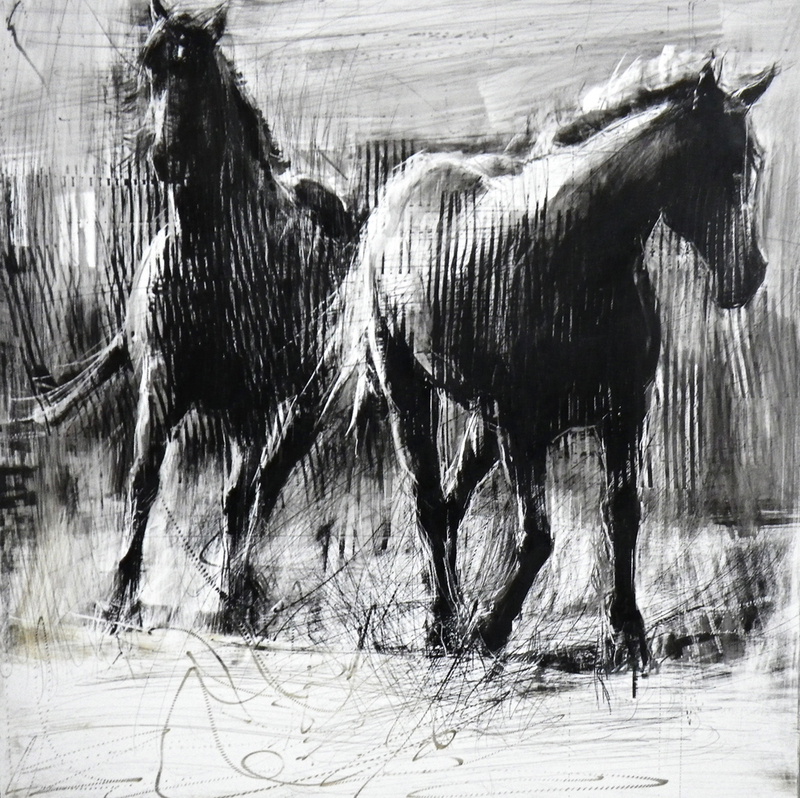 I finally ordered a few 12×12 cradled Claybords about 2 years ago, when I was preparing for a one person show of horses to celebrate the Chinese Year of the Horse. At first I couldn’t get pencil to work, nor color pencil, and I started throwing stuff on the surface in desperation. I washed all the stuff off, and noticed the surface was softer. I put sumi ink on it, and started scratching it off with a razor blade, then steel wool, and other tools. I loved the feeling of scratchboard I was getting, but unlike scratchboard, I could get grey tones, and marks left from the tools I was using. In order to get color with the black and white, I started using liquid water color and oil pastel. Like most artists, I’ve had oil pastels hanging around forever, but couldn’t find a use for them or a surface to paint on that made sense. I wanted to see if they’d work on the Claybord, and decided to take off the wrappers and use them on the side. I am primarily a soft pastelist, and using pastels on the side is the way I always have worked. The result was exciting– the oil pastel layered just like my soft pastels on paper! I used Sennelier’s oil pastel fixative for oil pastels, and was delighted with the textural effect. Your work is amazing and inspires me to try Claybord too! Congratulations on being accepted into Birds in Art, it's such a prestigious show! !